Looking for a coffee, food, a professor's office or your next classroom? 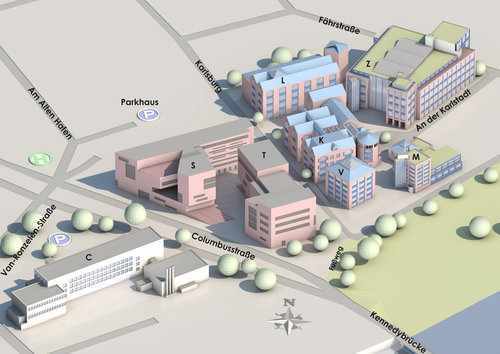 This overview about our campus with all the important rooms and service points will help you find it. In addition, you can find directions to the Hochschule and the bus schedule here. The Admissions and Examinations Office (I&P-Amt) is in charge of the administrative part of the study. Here you can hand over applications, collect marks, turn in sickness certificates and so on. The responsible contact person for each study course you can find in the tables of the German version here or by contacting the Information Centre. The Students Union/Organization (AstA: Allgemeiner Studierendenausschuss) represents all the students of the university. It is elected by the students-council (StuRa: Studentenrat) and is responsible for the political, social, cultural interests as well as sport-activities. It is run by the students and hence offers an open chance for all general students to become a member. A part of the semester contribution goes into the account of AStA which is used as a fund to support AStA organizing seminars, excursions, parties and other events. Generally, the professors provide their own scripts. Additionally, there is quite a great amount of literature for all disciplines available in the Library of the University of Bremerhaven. It belongs to the State and University Library Bremen, which means, it allows the access to all library materials located in Bremen as well. You can reserve borrowed materials by yourself in the catalogue. Due to the limited capacity of the shipment each user may order maximally 5 books at once. As a rule the material arrives at the branch library of the university after 4 - 5 days and waits there for 10 calendar days to be collected. To utilize this service, fill in and the form located at the end of this page (unfortunately only in German). Although this is obvious, keeping the borrowed library materials after the deadline will cost you a service fee of 2€ per book per day! However, you could renew it if nobody had already booked it before without facing any costs. Soft drinks, coffee (€ 0.80), tea, sandwiches, salads, sweets and other snacks as well as lunch (€ 1.00 - € 2.50) are available in our cafeteria 'Mensa'. Each month (Sept. to Dec. and Apr. to Jul.) on the first Tuesday at 06:00 PM, International Office organizes a small get-together, the so called “StuCa International” at the student café (StuCa: StudentenCafé, House K). The concept of this meeting is to create a platform which can serve to bring international students closer to German students and thus, accelerate their social integration in Germany. Therefore, German students are also invited along with internationals.